Galaxy Note8 Advanced Features Tutorial Tips and Tricks - Master your Samsung Galaxy Note8 phone with our in-depth tips and tricks guide. We reveal the best hidden features in the Note8 handsets, including tips for getting started, enjoying better battery life, customising every part of the Samsung phones, taking expert shots with the camera and plenty more. Activate Galaxy Note8 advanced features and change the settings that control them. S Pen: Change the settings for using the S Pen. Refer to S Pen features for more information about Air command, Air view, and Screen off memo. Games: Activate the Game Launcher and Game Tools icon and change the game-related settings. Refer to Game Launcher for more information. Identify unsaved numbers: Set the device to identify unsaved phone numbers when you receive incoming calls or messages. This feature may not be available depending on the region or service provider. One-handed operation: Activate one-handed operation mode for your convenience when using the device with one hand. This feature may not be available depending on the region or service provider. Quick launch Camera: Set the device to launch the camera by pressing the Home key twice quickly. Pop-up view gesture: Set the device to view the app screen in the pop-up view. Refer to Pop-up view for more information. Smart capture: Set the device to capture content that continues across multiple screens, and crop and share the screenshot immediately. Palm swipe to capture: Set the device to capture a screenshot when you swipe your hand to the left or right across the screen. You can view the captured images in Gallery. It is not possible to capture a screenshot while using some apps and features. Direct call: Set the device to make a voice call by picking up and holding the device near your ear while viewing call, message, or contact details. Smart alert: Set the device to alert you if you have missed calls or new messages when you pick up the device. This feature may not work if the screen is turned on or the device is not on a flat surface. 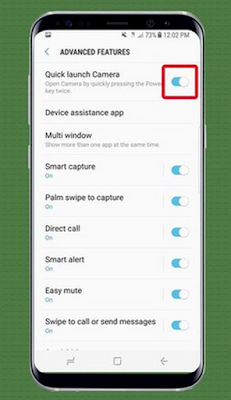 Easy mute: Set the device to mute incoming calls or alarms by using palm motions or facing the device’s screen downwards. Send SOS messages: Set the device to send help messages by pressing the Power key three times. You can also send sound recordings along with the message to the recipients. Refer to Send SOS messages for more information. Direct share: Set the device to display the people you contacted on the sharing options panel to allow you to share content directly. Video enhancer: Enhance the image quality of your videos to enjoy brighter and more vivid colours. This feature may not be available in some apps. If you've just bought the Galaxy Note8 and you want to get started with your gorgeous new smartphone, or you've had it a while and you want to dig deeper under the surface - you've come to the right guide. Here we reveal our top tips for getting the most from your Galaxy Note8, including the best features hidden away inside Samsung's mighty flagship. We cover everything from personalising your phone to mastering the camera for beautiful everyday snaps. Smart stay uses the front camera to detect your face and keeps the screen on while you're looking at it. Touch Search, then search for and select Smart stay. Touch Search, then search for and select One-handed mode. To turn on One-handed mode, touch the slider. Gesture : Swipe up diagonally from left or right corner to reduce the display size. Button : Touch the Home Key three times in quick succession to reduce the display size. Take a screenshot by swiping the edge of your hand across the screen while keeping it in contact. Touch Search, then search for and select Palm swipe to capture. To turn on Palm swipe to capture, touch the slider. Bring the phone close to your ear to call the contact whose message or contact details are currently on the screen. Touch Search, then search for and select Direct call. Your phone will vibrate when you have missed calls and messages. Touch Search, then search for and select Smart alert. To turn on Smart alert, touch the slider. 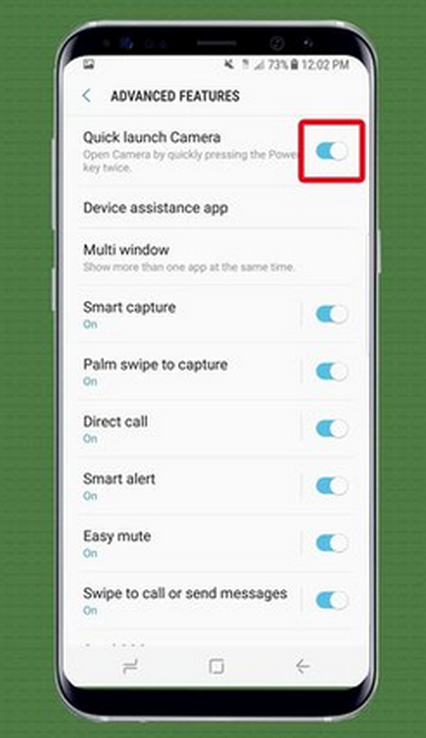 Mute incoming calls and alarms by putting your hand over the screen or turning the phone face down. Touch Search, then search for and select Easy mute. To turn on Easy mute, touch the slider. Enhance the image quality of your videos to enjoy brighter and more vivid colors. Touch Search, then search for and select Video enhancer. Check out our Samsung Galaxy Note8 user guide manual for everything else you might need to know about these handsets, including how the Note8 compares to the best phones of 2017. The Galaxy Note8 may be pretty much bezel-free, but at 6.3-inches it's still a beast of a mobile. If you pick the Note8 instead, even more so. But thankfully Samsung has chucked in a nifty feature for using the phone one-handed mode without fumbling it. Head to the Note8's settings menu and then tap Advanced Features, followed by One-handed Mode. This gives you two options for shrinking the Galaxy's desktops and any apps you're using towards the bottom of the display. You can either swipe up the screen diagonally from either bottom corner, or triple-tap the on-screen home button. The Galaxy Note8 share one of the best mobile cameras. This feature-packed snapper can shoot gorgeous-looking photos no matter what the lighting conditions, giving you the perfect way to preserve your memories - or simply catch the cat in action. We've compiled a guide to our most essential Note8 camera tips and tricks, to help you get started with that brilliant shooter and discover helpful features that you may have missed. From grabbing the perfect selfie to controlling the shutter for expert results, you'll find it explained in there. If you want some arty or funky effects, check out our full guide to the Galaxy Note8 camera and video modes. From here you can shoot slightly terrifying cartoon images of yourself, as well as use Bixby AI to tell you more about your surroundings. And that's just to start. Even with regular use, you can comfortably get over a day of playtime with the Note8 between charges. However, chances are you'll find yourself running low at some point when you're miles from the nearest plug socket - or perhaps you want to try and boost that effort to a full two days. Head to the Device Maintenance section of the Galaxy Note8's settings menu and then tap Battery. In here you'll find lots of handy features to try and extend your battery life. For instance, you can quickly check exactly which apps have been sucking the most juice since your last charge. Tap the circles alongside them and then hit the big blue 'save power' button and these apps will have their background activity privileges axed. In other words, they can't drain power when you're not actively using them. Samsung's power saving mode is also available to extend your battery life in times of need. Tap the 'mid' button to cut some non-essential features such as automatic syncing, which helps to drain less power. Or if you're in dire need of a good few hours of life, tap 'max' to trim all but the most basic of phone functions. Those virtual buttons which pop up at the bottom of the Galaxy Note8 display can be completely customised to your liking. Head to the Display section of the phone's settings menu and then prod Navigation Bar. From this menu you can swap around the layout of those buttons and also change the background colour to pretty much whatever you like, including the red effort above. You can also change the sensitivity of Samsung's built-in home button. If you're finding that your prods aren't quite registering each time, simply bump up the sensitivity to make sure you get a response. Good news, music lovers: the Galaxy Note8 support Bluetooth 5, which is great news when you want to wirelessly enjoy your tunes on a speaker or your BT headphones. Bluetooth 5.0 is more power efficient than previous versions, so your Galaxy Note8's power won't be sapped so quick. You can also stream music to a speaker or 'phones at up to four times the range at 128kbps, or twice the range at 500kbps. What’s more, the Galaxy Note8 supports streaming of music to two devices at the same time. Samsung's ‘dual audio’ feature gives you support for two Bluetooth speakers or two pairs of wireless headphones at the same time, irrespective of brand, make or model. That's particularly useful if you're on a train, for instance, with your best bud. Both of you can enjoy some tunes or a movie without that awkward sharing of one set of earphones thing. The Note8 boast a sizeable screen, which is a perfect canvas for using two apps at the same time. You can thankfully do so quite easily, using Android's nifty split-screen mode. To get two apps running on-screen at the same time, tap the recent apps button on the virtual bar at the bottom of the phone's display. A list of apps you have open will pop onto the screen. From here, tap the split-screen icon on the first app you wish to use - this looks like two boxes, one on top of the other. The display splits in half. In the top half, your chosen app will appear. In the bottom half, you'll see a scrollable list of other apps running in the background. Simply tap your second choice and it will fill the bottom half of the panel, so you can use both at once. Alternatively, in the Advanced features Note8 > Multi Window section of the settings menu, you can turn on the 'Use Recents Button' option. With this active, simply hold down the recent apps button on your Galaxy Note8 device when you already have one app open. This will divide the display in the middle, with the current app shifting to the top half of the screen. You can now choose your second app as before. Can't see the app you wish to open in that scrollable list? Not a problem. All you need to do is tap the Galaxy Note8's home button to return to your desktops and from here select the second app you wish to use in split-screen mode. The original app will reappear at the top half of the display and the new app will pop up at the bottom. Alternatively, tap the 'more apps' button on the bottom half of the screen to select something else. You can resize both windows simply by pressing your finger on the central divide and dragging it up or down. And to exit split-screen mode, drag that divide to the very bottom of the Note8's display. Note that not all apps support split-screen, so many games for instance will throw a wobbler. The Galaxy Note8 show off Samsung's new Bixby AI, a rival to the likes of Google Assistant and Cortana. Bixby is supposed to be one of the smartest portable assistants ever devised, but unfortunately it won't be ready for a while yet. Which is even more of a shame, because the Note8 handsets have a dedicated Bixby button which will essentially be useless at first. You can remap that Bixby button to load up Google Assistant instead, Here's what you need to do. First, download an app from Google Play called All In One Gestures. When this is installed, open it up and head to the Hard Keys tab. Tap the Enable button - you’ll need to turn on the All in one Gestures permissions to proceed. With that done, head back to the app and tap the menu button in the top right. Next, poke the Custom Keys option and push the physical Bixby button on the Note8. This will load the Bixby AI, so press back to return to All In One Gestures. The Key Code field will be reading ’1082’. Press Add, and the app will register this key code under Custom Keys. We really quite liked Samsung's Game Launcher feature from the Galaxy S8 and S8+ so we're happy to see this tool return in the Note8. You can find it in your list of apps. Game Launcher is a nifty way of grouping all of your games together, but also adds some funky features for whenever you're enjoying some downtime. For a start, you can stifle notifications when playing games, with a tap of the icon on the main Game Launcher screen. Great news if you don't want any distractions. There's also a performance mode which devotes more processing power to your game, if you want to play something that's particularly demanding - not that we've seen any stutters on the Note8 thus far. Once you're in a game, you can open the Game Launcher menu by tapping the special icon in the virtual bar. From here you get access to more handy features, such as the ability to record your gaming session to impress all of your great mates. You can enable or disable the Game Launcher feature at any time in the Galaxy Note8's settings menu. Just head to the Advanced Features option and then tap into Games. 1 On the Settings screen, tap Advanced features → Send SOS messages, and then tap the switch to activate it. 2 Follow the on-screen instructions to add emergency contacts if you have not already done so. To send help messages with audio recordings or photos, tap the Attach audio recording or Attach pictures switch to activate it. The Attach pictures option may not be available depending on the region or service provider. On the Settings screen, tap Advanced features → Send SOS messages → Send messages to → ADD. Tap Create contact and enter contact information or tap Select from Contacts to add an existing contact as an emergency contact.